Since 1970, 54 RB’s have had 50% or more of their team’s rushing attempts, though only 4 (Edgerrin James, LaDanian Tomlinson, Curtis Martin and Eric Dickerson) had more than 75%. Chances are, 2012 rookie Trent Richardson will easily surpass 2011 rookie leader DeMarco Murray’s 40.2% of Dallas’ rushes. The other early picks, Doug Martin, David Wilson, Isaiah Pead and LaMichael James all figure to be in rotational or situational roles and none are good bets to top the 50% mark barring injury to their team’s other RB’s. Overall, a very impressive and Canton worthy resume. His 30 career fumbles is 10th best for RB’s with 1000+ carries and his 1% fumble rate is the 2nd best all time for a RB (Curtis Martin is #1) with 1500+ touches. His single-season TD record (31), set in 2006, is impressive. Though the record was set 4 times in the 7 season from 2000 and 2006 (Marshall Faulk, Priest Holmes, Shaun Alexander and Tomlinson), it seems unlikely that it will be topped for awhile. The league has moved so far away from “feature” backs that it is tough to imagine a RB getting enough touches to get 32+ TD’s in a single season. Of the backs in the league, dual threats like Ray Rice, Maurice Jones-Drew or Matt Forte could make a run at the record, maybe Adrian Peterson if he recovers from knee surgery. But otherwise, it seems that Tomlinson will hold the record for the foreseeable future. Similarly, Tomlinson’s place as 5th overall in NFL history in career rushing yards might not be challenged for awhile. Tomlinson ended his career with 13,684 rushing yards. The leading active rusher is the currently unemployed Thomas Jones with 10,591 yards (22nd all time). At 33 years old and nothing more than a part timer, if he even suits up in 2012, Jones won’t top Tomlinson. Behind Jones is Steven Jackson at 9,093 yards. At 28 years old, it’s possible for Jackson to end up in the top 5 all-time. To do that, Jackson would have to do something most late 20’s and early 30’s RB’s don’t – stay healthy and highly productive. One way to measure a RB’s success is by using YPC+ – a measure of his yards per carry relative to the league average. After all, a 1200 yard season isn’t impressive if that RB averages 3.2 yards per carry in an era where the league average is 4.4 YPC. It’s easy for people to get a bit blinded by gaudy yardage stats without taking into account yards per carry. For example, Cedric Benson ran for 1,111 yards in 2010 – good for 13th best in the league. But his meager 3.5 YPC was 42nd out of 46 RB’s who had 100+ carries. Benson ended up with a YPC+ of just 83, or 17% worse than league average. From that point of view, his “good year” looks pretty bad. As you can see, Tomlinson’s 102 YPC+ is good for 7th best of this group. However, his longest streak of consecutive 100+ YPC seasons was 3 and he only had 2 115+ seasons. He also had the 2nd fewest 100+ YPC seasons (less than half of his seasons in the league). Now, his receiving ability and use out of the backfield gives him a dual-threat aspect that some other top RB’s didn’t have. Tomlinson leads the way with an average of 57 catches per year, though his 7.8 YPC is behind Payton, Allen and Sanders. Only 3 RB’s since 1970 have produced more yards per touch than Tomlinson. As a pure rusher, I wouldn’t put Tomlinson in the top 5 of the modern era. 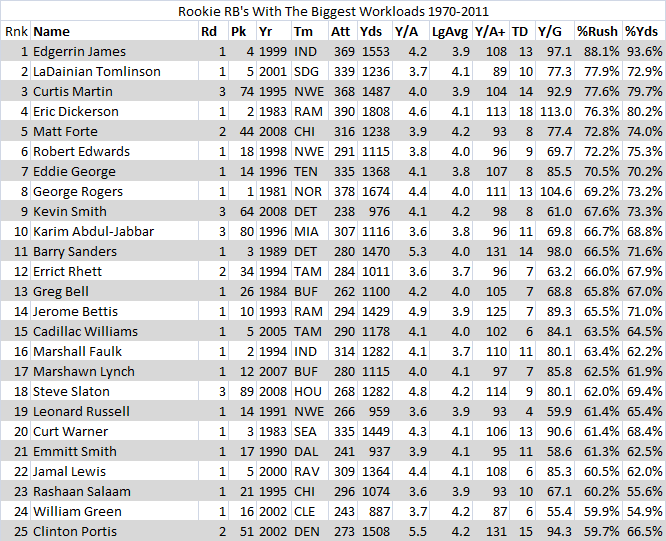 However, as an overall RB, he is definitely one of the most productive and most talented that the league has ever seen. The 2000 draft, like most years, was a bit of a mixed bag but overall a fairly weak class. The two best players, by far, were separated by 100 picks: 9th overall Brian Urlacher and 199th overall Tom Brady. There were a number of high quality players taken in between, including 3 Jets: Shaun Ellis (12th), John Abraham (13th), Julian Peterson (16th), Shaun Alexander (19th), Chad Clifton (44th), Laveraneus Coles (78th) and former All-Pros Adalius Thomas (186th) and Mike Brown (39th). There were also a number of notable (and high profile) flops, especially in the “no-man’s land” of the late 1st round: Sylvester Morris (21st), Chris McIntosh (22nd), Rashard Anderson (23rd) and R.Jay Soward (29th) were all out of the league by the end by the end of 2001 due to injuries or legal problems. Even those of us who remember Taylor beyond just being vaguely familiar with the name would probably be surprised to learn that he played in 101 career games with 90 starts before washing out of the league in 2007. In no way was he worth a top 10 pick, but as far as 1st round picks go he is probably middle of the road in terms of production. His career best year was 2002 when he had 61 catches for 869 yards and 6 TD’s. Anyone who followed college football or the NFL draft in the late 1990’s and early 2000’s knows how hyped Dayne was. 5’10 and 250+ lbs, he was thought to be a real-life version of Tecmo Bowl’s Christian Okoye and ended up more like a poor man’s real life version of Christian Okoye. In Dayne’s 4 years with the Giants, he averaged a pitiful 3.5 yards per carry, despite getting ample opportunities to establish himself as the #1 guy in New York. He enjoyed a brief late-career resurgence in Houston in 2006-07 and has been mostly forgotten ever since. Despite going 11th overall, the 2000 running back class didn’t offer much after Dayne came off the board. Only Shaun Alexander and Mike Anderson were high quality players. Sammy Morris and Reuben Droughns stuck around awhile as HB/FB hybrids and carved out nice niches for themselves. I didn’t understand it at the time and I still don’t. Flowers had no business going in the top 50, let alone late 1st round. He played just 2 years with the Bills as a failed pass-rusher, bounced around for a few years and was out of the league after 2004. The Rams have had a whole lot of forgettable 1st rounders and Canidate might be the worst of them all, In 3 highly forgettable years with the Rams, he rushed for 495 yards (441 of which came in his 2nd season). He was an Al Davis special – blazing fast but with no real football ability. Reportedly, the Rams had timed him running the 40 yard dash in the 4.2 – 4.3 range pre-draft and thought his speed would be impossible to contain on the (then) Astroturf of the Rams’ dome. Somehow, they swindled the Redskins into giving up a 4th round pick for Canidate. He looked like he might be on the path to realizing his potential, starting 10 games with the Redskins and racking up 600 yards with a respectable 4.2 YPC, However, a fairly severe foot injury and the 2004 acquisition of Clinton Portis ended Canidate’s time in Washington and he never got a chance elsewhere.